It was a quiet day for every major currency except for the British pound, which dropped like a rock as Parliament voted down one amendment after the other. Eventually they passed Caroline Spelman’s amendment to block a no deal Brexit by a razor thin 318-310 vote and the Brady amendment that calls for an alternative backstop to avoid a hard border with a 317 to 301 vote. Although these amendments are not legally binding, Theresa May can’t continue to ignore the resistance towards leaving the European Union with no Withdrawal agreement. Privately May said to lawmakers that she plans to rule out no deal and after today’s vote she needs to make it official. It is nearly impossible for a deal to be reached before the March 29th deadline so May has no choice but to request for an extension of Article 50. Seeing her defeat in Parliament, the European Union is playing hardball with Juncker taking every opportunity this week to make it clear that they won’t renegotiate the Brexit deal. So unless May can convince them otherwise (and we don’t think that’s likely), her only recourse is to negotiate a backstop agreement that has cross party and EU support. It won’t be easy and judging from the performance of sterling, investors don’t expect these amendments to bring a resolution quickly. Instead it will prolong Brexit uncertainty leading to more weakness for the currency. GBP/USD fell hard today and even though 1.3050 is an important support level, we expect it to be broken quickly in a move that should take the pair below 1.30. As we continue to watch Brexit headlines, the focus returns to US dollar. Q4 GDP numbers are scheduled for release and will be followed by this year’s first Federal Reserve’s monetary policy announcement. The greenback is under pressure as investors expect the Fed to rule out a near term rate hike in the face of softer data. Although many economic reports were delayed due to the shutdown, most of the ones that have been released show slower growth. Consumer confidence, which was released today dropped to its lowest level since September 2017. 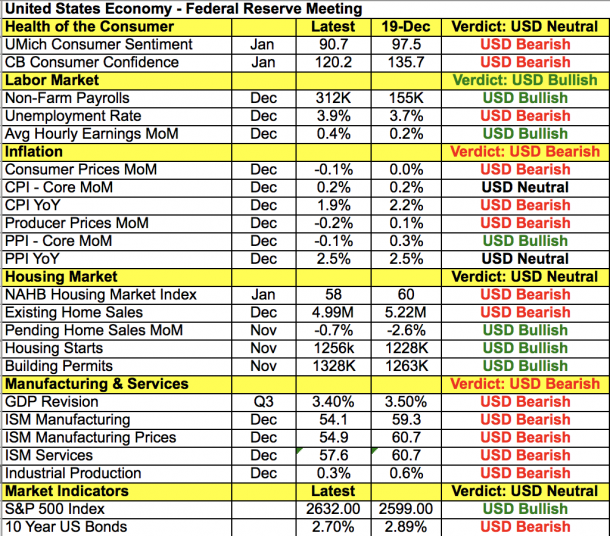 The table below compares the changes in major economic reports since the FOMC last met and while the labor market remains rock solid, consumer sentiment, inflation and economic activity indicators are lower. The Fed is not expected to make any changes on Wednesday but this year Fed Chair Powell will hold a press conference after every meeting. So even if policy remains unchanged, the dollar could move as the market gets an updated assessment on the economy. The last time we heard from Powell on the 10th of the month, the dollar rallied after he said they wanted to return the balance sheet to normal level but gave back his gains as he emphasized the need to be patient and flexible. The Australian dollar is also in play tonight with fourth quarter inflation numbers scheduled for release. Even though RBA member Harper said the next move in rates will be up, the currency extended its losses after the NAB business conditions index fell sharply. We expect price pressures to ease because consumer inflation expectations have fallen. If annualized CPI growth slows from 1.9% to 1.7% or lower, AUD/USD could slip down to 71 cents. The New Zealand dollar ended the day unchanged despite a larger trade surplus and the Canadian dollar shrugged off the 2% rise in oil prices. Euro traded higher for the third consecutive day but it may find it difficult to extend its gains on the back of tomorrow’s Eurozone confidence and German inflation data. Given the decline in the ZEW, IFO and PMIs, the sentiment indicators should be weaker. Price pressures are also expected to fall sharply but could beat because oil rebounded in January.